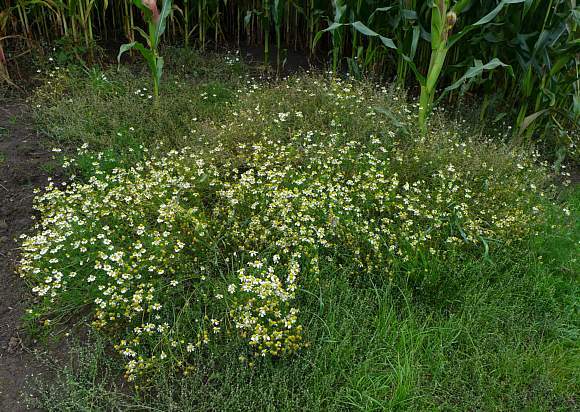 Grows in arable fields as a weed, these in the margins of a field of Maize. A spreading sprawling plant to 50cm. Flowers like a large version of Daisy but with only ~12 petals ±1 (excluding those that have fallen off). But the leaves are totally different from those of Daisy, being fine and wire-like. 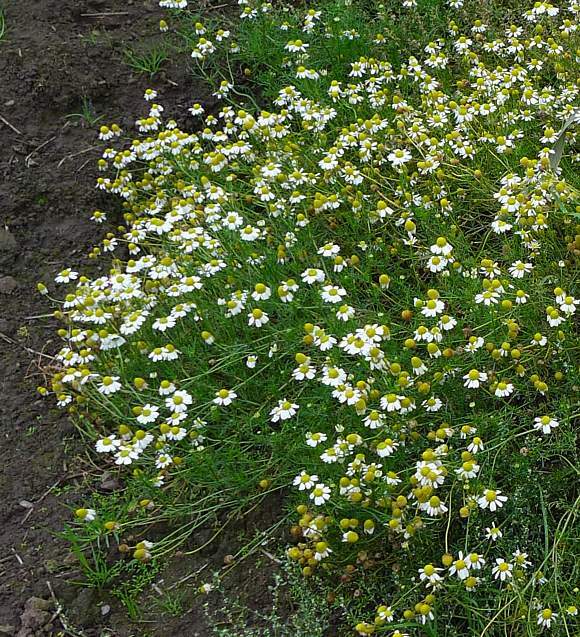 Has white petals (actually ray-florets) and a large usually bulbous yellow dome of disc-florets. Stems ribbed/fluted, depending upon your point of reference. 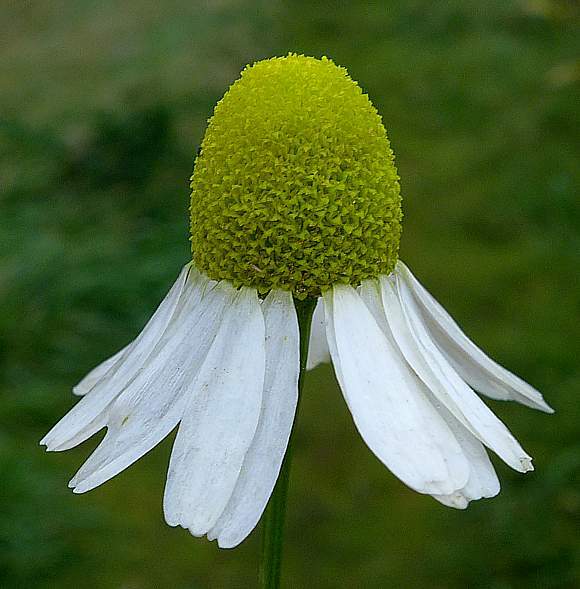 Typical 'shuttlecock' shape when not bedraggled by wind or rain, petals reflexed (many are not). The bracts supporting the flower behind in a flattish saucer-shaped 'cup' (rather than a bowl of (just a few) similar flowers). There are said to be reflexed 'ligules' (tiny bits of flesh at the base of the leaves as they emerge from the nain stems). 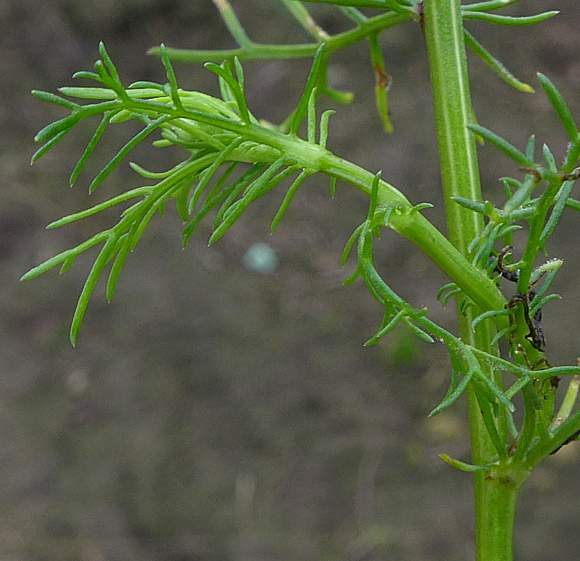 It is possible that the two wire-like projections seen in the photo are these ligules (well one can be seen, the other one presumably hidden by the stem). Not to be semantically confused with the Genera : Cotula [which means 'cup' in Greek, and names the Buttonweeds group, which also belong to the same Daisy & Dandelion Family as does Anthemis cotula] nor with Chameleon (Houttuynia cordata) which belongs to the Chameleon Family (Saururaceae). 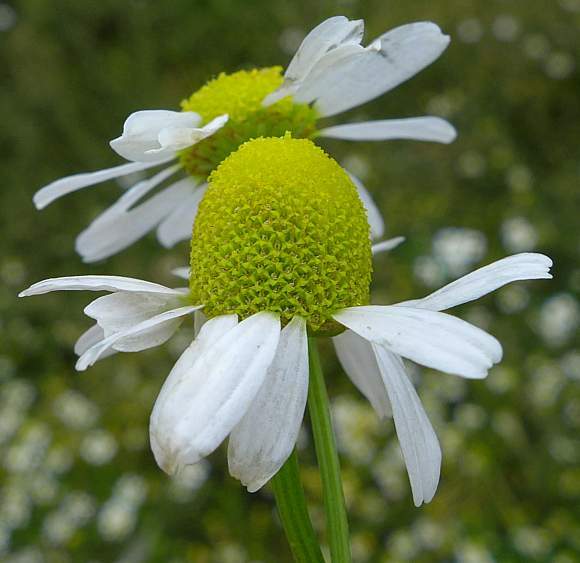 and other so-called 'Mayweeds' such as Scented Mayweed (Matricaria chamomilla) which is strongly sweetly scented when fresh. Sea Mayweed (Tripleurospermum maritima) but that is shoter and more succulent and grows on shingle/sand beside the sea. 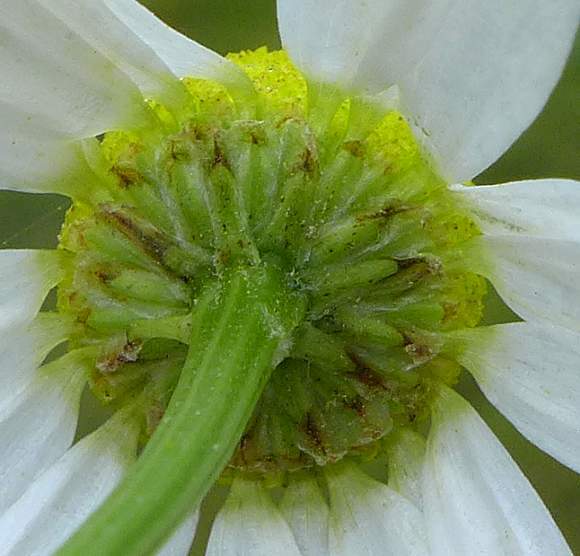 Scentless Mayweed (Tripleurospermum maritimun ssp. 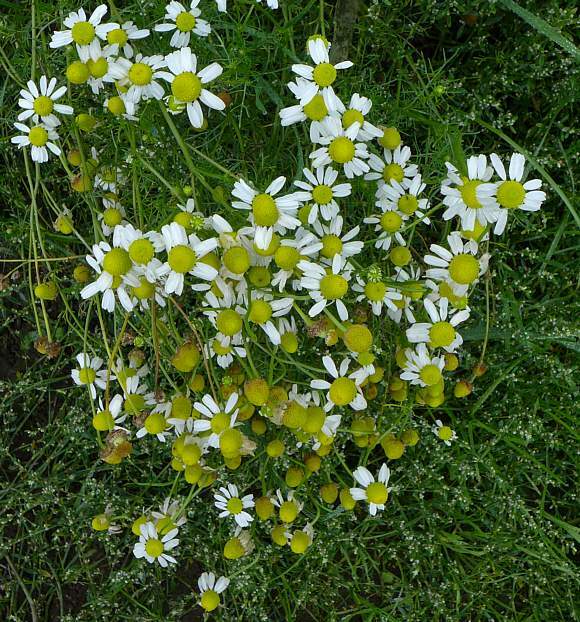 inodorum) which, although a sub-species of Sea Mayweed, is not succulent and lacks any smell when crushed. 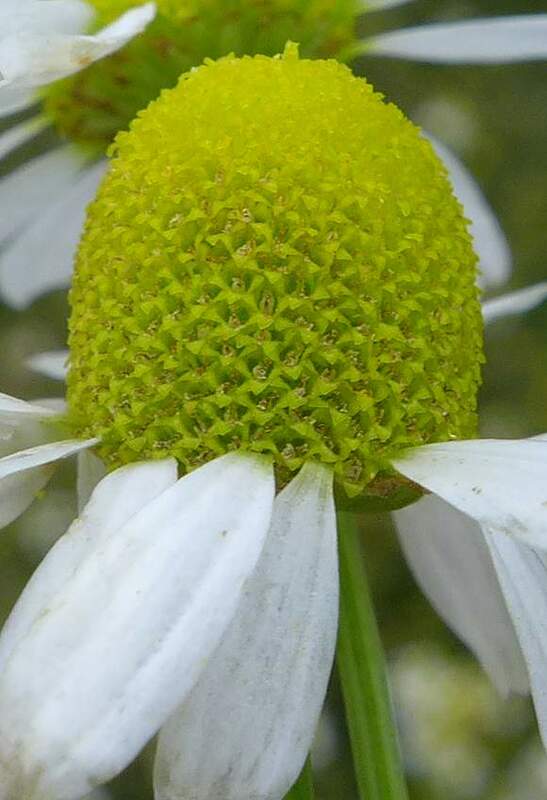 However, Stinking Mayweed stinks, and thus is easily recognisable from all the above by means of this unique feature (for Mayweeds/Chamomiles) alone! 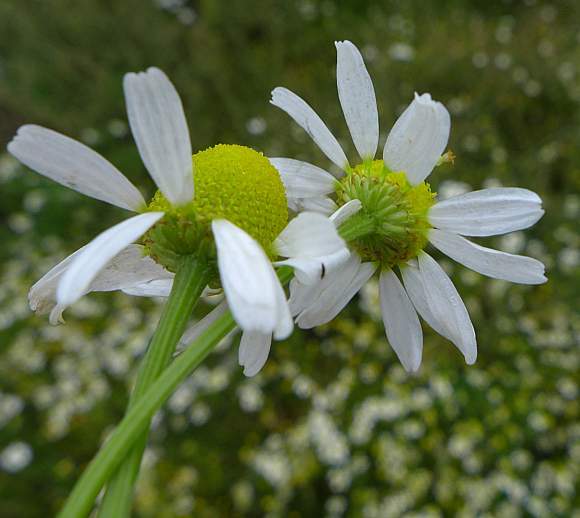 Both Stinking Chamomile and Scentless Mayweed (Tripleurospermum maritimun ssp. 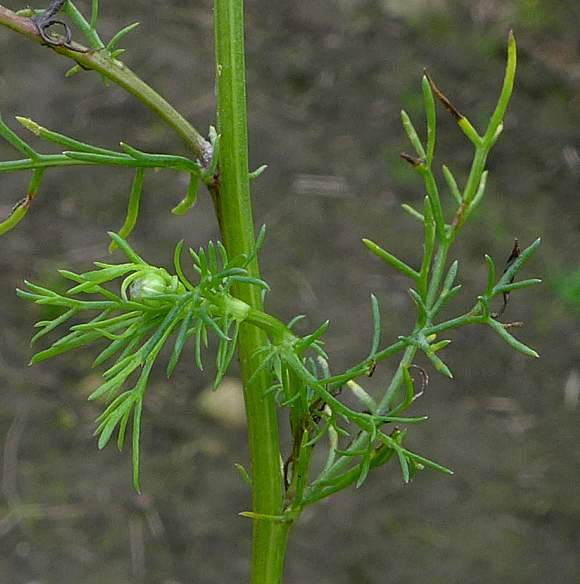 inodorum) are much the more likely species to be seen in early Autumn. Distinguishing Feature : it smells sickly/nauseous when crushed (rather than sweetly or aromatically). It lacks a pappus ('seed-clock'). 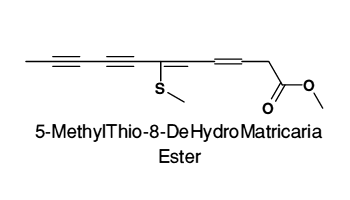 It also contains several poisonous polyacetylenes (polyynes) all based upon DeHydroMatricaria Ester, which contains not just 2 triple bonds as Matricaria Ester, but three (hence the '8-dehydro' prefix). 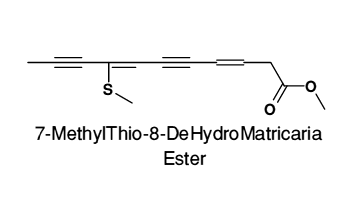 There are also three (only two of which are shown) methyl-thio derivatives of this, containing only 2 triple bonds. The shape of the molecules is shown only schematically, the Z- and E- bends are not depicted. These polyynes occur in the roots of the plant and exhibit significant anti-mycobacterial action as well as allergenic activity. 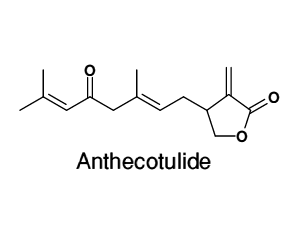 The plant contains Anthecotulide, a non-volatile oil, is a sesquiterpene lactone known to be a potent contact allergen. It is present in the leaves at 1.5% and in the flowers at 7%. 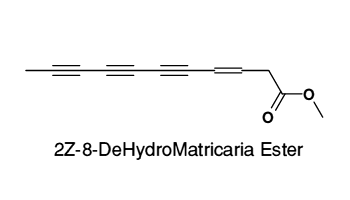 There are five more sequiterpene lactones present with similar, but not identical, side-chains. The extra side-chains are variously -OH groups or -O-CH3 groups. 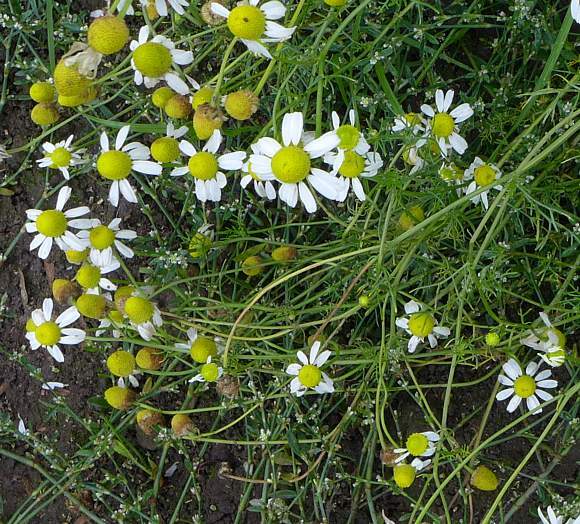 (Claims that this potent allergen is sometimes found in the essential oils nominally obtained from Chamomile is highly likely to be due to contamination of Chamomile collections with Stinking Mayweed; they look very similar in the field). 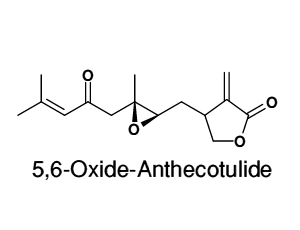 The 5,6-epoxide of Anthecotulide is also present, and one assumes it is more potent that Anthecotulide itself. 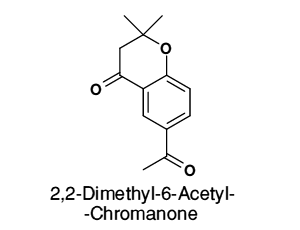 These compounds are common in members of the Dandelion & Daisy family and are present in the aerial parts of Anthemis species, which includes Stinking chamomile. IsopentylAcetophenones and Benzopyrones (chromenes) like both the above exhibit growth-inhibitory and anti-inflammatory activity in yellow mealworm larvae. 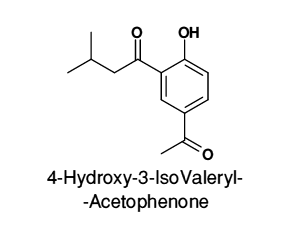 Prenylated Acetophenones may also have phytoalexin activity; anti-micromial compounds that accumulate in plants when under stress such as by infection. 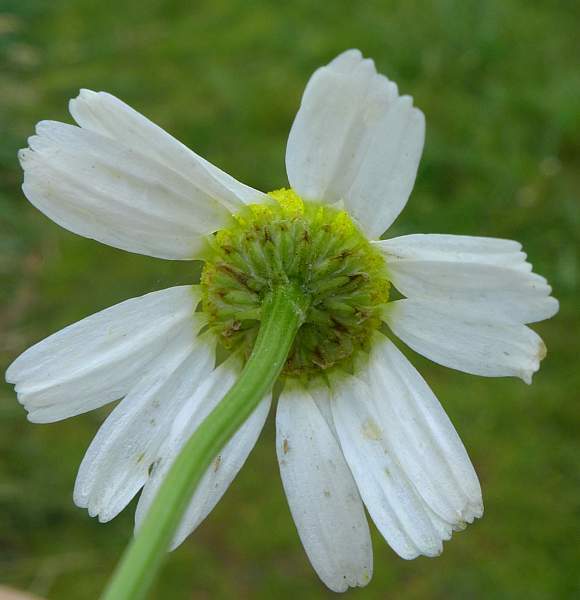 It is possible that their detection in Stinking Chamomile is as a result of such an infection, and that they are not normally present (but when are plants under no threat from infection? ).